Last Friday night’s massive 7.6 magnitude quake that hit just off the coast of Samar has been quickly followed by a 5.9 magnitude tremor at sea just West of Mindanao last Monday and then, early yesterday morning, another 5.6 magnitude quake in the province of Bukidnon. We Filipinos are no strangers to earthquakes, of course; and, indeed, the country is part of the so-called Pacific Ring of Fire. There has been damage, needless to say. Thankfully, however, whatever damage the quakes have caused has been remarkably light considering their strengths; and most especially the one that hit last Friday. That 7.6 magnitude quake has been likened by scientists to the atomic bomb dropped at Hiroshima a thousand times over. Take a quick look at the table of the twenty most destructive earthquakes worldwide since 1900 and you will quickly appreciate how things could have been different; and how very lucky indeed the people of the affected areas have been. 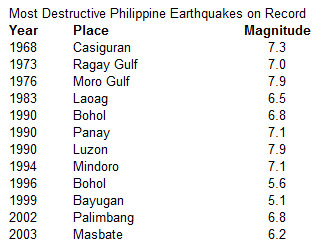 Of the twenty, no less than twelve were less or as powerful as the magnitude 7.6 of the Samar quake. The most destructive quake ever, for instance, killed more than three hundred thousand people in Haiti in 2010 and was at a ‘mere’ magnitude 7.0. It is interesting to note that no less than seven of the twenty most destructive earthquakes occurred in the month of December. Did the Mayans know something that they left without telling? 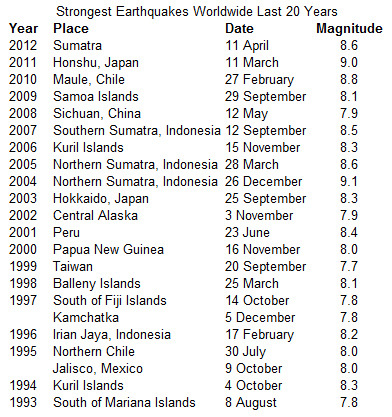 Notice also that four of the twenty occurred in China; and if you add the two quakes in Japan and the one in Sumatra, that comes to a total of seven or 35% of the world’s most destructive quakes happening on our side of the world. Notice, too, that five of the twenty most destructive quakes or a remarkable 20% happened after the turn of the millennium. Maybe just pure coincidence, who knows? 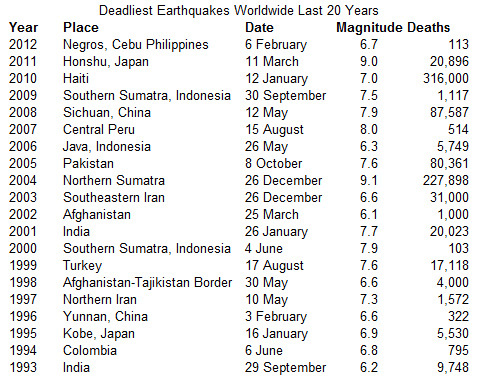 While the previous table showed the most destructive earthquakes in terms of human fatalities, the table below shows the most powerful earthquakes in terms of magnitude in the last twenty years. Five of the twenty occurred in Indonesia, two in Japan and one in China. 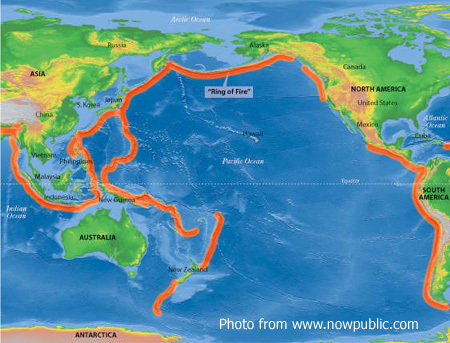 Add the powerful quakes in Taiwan, the Kuril Islands, Papua New Guinea and the South Pacific islands to these and no less than fifteen of the twenty happened on our side of the Pacific Ring of Fire. Life is, indeed, exciting where we are! 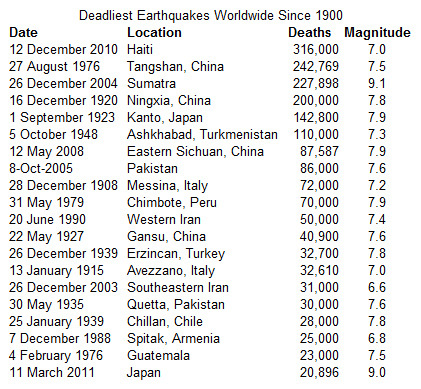 Now consider the table below of the most destructive earthquakes worldwide in terms of the loss of human lives. The Haiti tremor, of course, is the all-time most destructive. However, no less than nine of the twenty occurred once again on our side of the world. In Indonesia alone, a total of 234,867 lives have been lost due to earthquakes, the most being in the Banda Aceh quake of 2004. 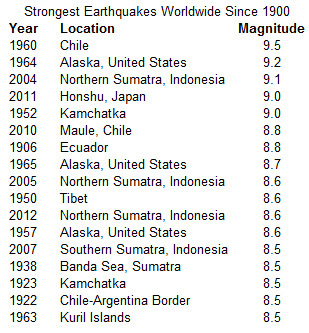 Now, consider this table of the most powerful earthquakes since 1900 in terms of magnitude. While Haiti owns the rather dubious distinction of having been visited by the most destructive earthquake in recent times, Chile owns the distinction of having been visited by the most powerful earthquake, an unbelievable 9.5 magnitude! Honours are fairly even, with nine of the twenty on our side of the Pacific and the rest on the other side. Notice that while Europe and Central Asia have had their fair share of earthquake devastation, these parts of the world have not experienced the sort of rock ‘n’ roll that we do in the Pacific Ring of Fire. Finally, some statistics from the PhilVocs. I am old enough to remember the Casiguran earthquake of 1968 and the much talked-about Ruby Tower collapse. Of course, the 1990 Luzon quake which devastated Baguio is something that I will remember for the rest of my life. Although the epicenter of the quake was far from Lipa, it was the only time in my life when I ever saw the earth tossing up and down in a wave. Scary, definitely scary! I hope never to see anything like that again ever in my life!